Pandit Habib Khan has been studying music since a young age, and producing recordings and teaching for over 10 years, but thanks to KCSM radio, I just recently became aware of one of San Jose’s local music treasures. Khan’s music spans a wide range from traditional Indian styles to jazzy fusion. I love the mix of fast-paced sitar and smooth piano and guitar riffs. To hear Pandit Habib Khan’s music, click through to his website. In the music section, keep clicking because not all the album links seem to be working. The free Lunchtime Lecture series takes place on the first Wednesday of the month beginning at noon in the Charlotte Wendel Education Center. Bring your lunch or purchase from the Museum’s Cafe. Visit the exhibition Roots in the Air, Branches Below: Modern and Contemporary Art from India (for which regular Museum admission applies). 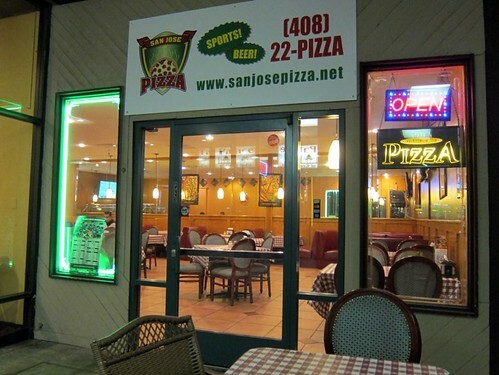 Our chef neighbor recommended that we try San Jose Pizza (“The House of Desi Pizza”). Tonight, three of us ate an excellent dinner there. The location is confusing (look deep between the yogurt shop and the nail place) but worth the hunt. 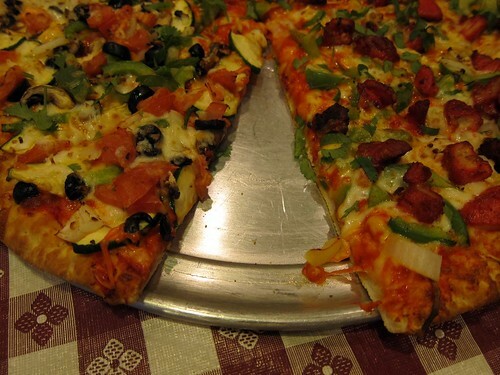 My husband and I were adventurous and discovered that Indian spices and tandoori chicken go very well on pizza. Our teenage son ordered a more basic combination but was just as pleased. 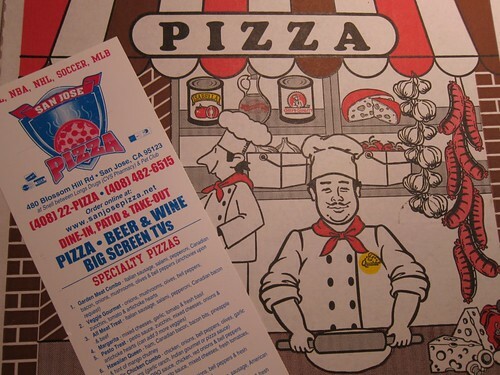 The TV was loud, the decorations modest, and the room was cold but the food is delicious and staff are very friendly. Media Credit: Mike Anderson, The Spartan Daily — Pavan Kumar Yalamanchili, a general engineering masters student, writes a message on a poster in remembrance of victims of the attacks in Mumbai, India, during a gathering near the Event Center on Tuesday. SJSU’s student newspaper The Spartan Daily had amazing coverage this morning of some students whose lives were personally affected by the attacks in Mumbai, including a student whose parents worked two blocks from the attacks. Though they survived, some of his friends’ friends didn’t. The article cites a handful of students who knew people who died. Hearing what these students have to say makes it all the more real to me, because I don’t have any personal connection to India or Mumbai in particular. That’s why I’m looking forward to hearing the “podcast open mic” that Steve Sloan is coordinating on campus in Clark Hall room 116 at 4:30 p.m. today. If you can make it and have something to say, please do. Also check out Mumbai’s Metblog for some news updates and moving first-hand accounts. 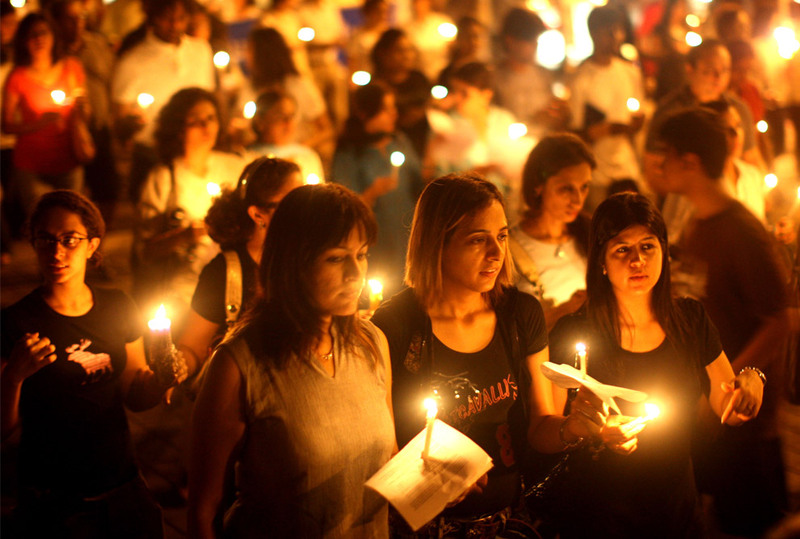 Count me as one San Jose resident who is saddened and outraged at the recent attacks in Mumbai. And if you count yourself as one too, there is a memorial going on as I type at El Paseo near the Event Center on the SJSU campus (see the campus map). It began at 11 a.m. and will go to 12:30 p.m. and is open to anyone in the community who needs an outlet for their grief. Organizers are asking community members to wear white — the Indian color of mourning — and to pause for a 10-minute moment of silence today. Also, Steve Sloan, a journalism instructor and campus tech support specialist, writes on his blog that he will be producing a podcast tomorrow (Dec. 3) at 4:30 p.m. in Clark Hall room 116 and wants to include campus and community reactions. He is inviting SJSU students and other members of the public who want to share their perspectives. One more thing: Boston Globe’s The Big Picture blog uses few words, but still ranks as probably the most chilling reporting I have seen on the attacks on the city formerly known as Bombay. Many of the more graphic images are put behind a black box, but I do encourage you to click on them to reveal the gruesome reality of the attacks, if you have the sensibilities to view them. They also did an excellent series on the aftermath, where the photo on this blog post comes from. EDITED TO ADD: Mumbai’s Metblog site has some terrific updates from bloggers on the ground there. The “friendly man at Cinequest” had pointed me to Amal, after inquiring which country I am from. An Indian movie (actually Canadian, set in India) at Cinequest was a pleasant surprise. Also, it was a very useful input for me when I was wondering which movies to watch at the festival. To top it all, this was probably the best I watched in these few days. Saturday night at Cinequest was busy as expected. I went along with my wife to California Theater. After some trouble navigating our way through Downtown, we reached the end of a long line waiting outside. 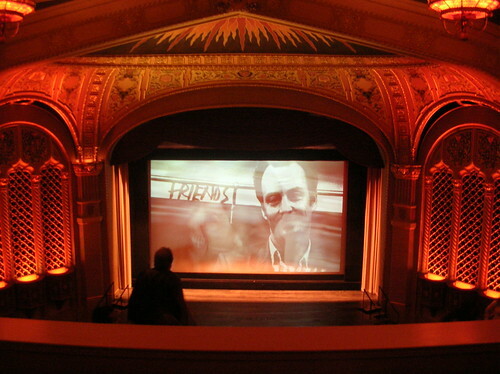 We made our entry just 10 minutes before the screening and were blown away by the grandeur of California Theater. It was reminiscent of a different age. The surprises for the day were still not over. There was a small change introduced to the program — 2 ‘Bollywood’ dance items preceding the movie. The audience heartily cheered the amateurish performances. Coming to the movie finally, it was a wonderful drama with a dose of philosophy and some suspense too thrown in. Wonderfully acted and directed, it featured some leading arthouse names in key supporting roles. Amal also opens the 26th San Francisco International Asian American Film Festival, March 21-23 in San Jose. So, catch it there if you missed it at Cinequest. The screening was followed by a nice Q&A session with the young filmmaker, Richie Mehta. The Mynt was recommended to me a long time ago and finally we decided to go there for Valentine’s Day. (Yes, I’m late on the post too!) As the name suggests, it is an Indian restaurant with a twist. While the basic dishes are Indian, they infuse inspiration from all over the world. “Fusion Indian food” might be a good term to sum it up. On the day we went, we had no option but to go for their special meal. So, our experience is limited in that sense. It’s high time I resumed the Indian restaurant series. At least Gary has been prodding me for long. And it’s good to blog about one of the best that we have — Amber. It would be difficult to dispute its position as the best Indian restaurant out here. I should say that it’s almost on par with the top restaurants back in India. San Jose in America! America!! San Jose is of course in America. However, I’m referring to the Kannada (Indian regional language) movie titled America! America!!. The movie, released in 1995-96 made big waves, but it took me so long to check it out. What timing though, coincidentally! Though basically a triangular love story, the setting is mostly in the USA. It covers aspects like the life of Indian immigrants and the job scene. What more, most of it is in San Jose and the surrounding areas.